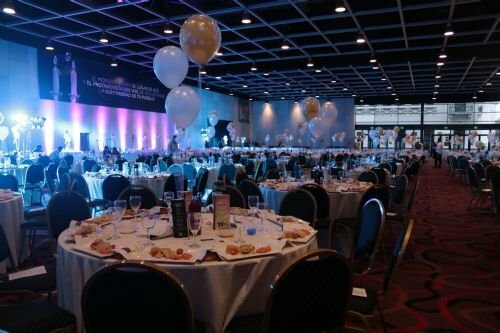 A Shabbos Meal For 1,500 People Last Friday night was no ordinary one for 1,500 young adults in Buenos Aires, Argentina. Students and young Jewish professionals celebrated Shabbat dinner at the La Rural convention center. They talked and sang and bonded over a three-course catered dinner that lasted until the wee hours of the morning. The event, which was the largest of its type in South America to date, was organized by the Jewish youth group El Lazo Juventud Judía. Run by Chabad Rabbis Shlomo and Zalmi Levy and their wives Rachel and Rivka, the center has been a solid presence in Buenos Aires over the past twenty-two years, serving students and young adults full-time. Tickets to the much-anticipated dinner were sold out a week in advance—leaving 200 people on the waiting list, hoping for a chance to join the party. 250 of the guests joined the Kabbalat Shabbat prayers before dinner. "The feeling at the event was incredible—everyone felt proud to be Jewish," shared Rabbi Zalmi Levy. "For many of those attending, this was their first time at a Shabbat meal." Levy says the dinner accomplished its purpose: creating an event where Jews get to meet other Jews. Indeed, 80 percent of the Mega Shabbat participants said the dinner provided a great opportunity to meet new people. Jessica Melul, a young woman who recently joined Buenos Aires' workforce, was hesitant to sign up for last year's mega Shabbat dinner at first. But her friends convinced her to join them—a life-changing decision, it turns out. While waiting on line to wash her hands before the meal, she met Jair Plavnick, another young professional. The couple is getting married this year. Economist Mathias Ferraro described his experience at Shabbat 1500 as "simply awesome."